Why Is J.D. Irving Calling On The CBC To Remove "Unprofessional" Story? Why Is J.D. Irving Calling On The CBC To Remove “Unprofessional” Story? The firing of New Brunswick’s chief medical officer has raised questions among the community about possible corporate influence on government and has prompted corporate giant JD Irving to demand the removal of a CBC article. The firing of New Brunswick’s chief medical officer has raised questions among the community about possible corporate influence on government and has prompted corporate giant J.D. Irving to demand the removal of a CBC article. CBC New Brunswick has published an article about Dr. Eilish Cleary, who was put on leave — and subsequently fired — from her job as the province’s chief medical officer. Before her departure she was working on researching glyphosate, a herbicide deemed “probably carcinogenic” by WHO, which is being used by J.D. Irving and NB Power in the province. J.D. Irving claims that “CBC presented an unsubstantiated conspiracy theory as fact.” Jacques Poitras, who wrote the story, does not speculate in the piece as to the reasons for Cleary’s dismissal, but does mention that J.D. Irving’ and NB Power use glysophate. Invoking JDI’s name gave way to comments and tweets asking whether the company had any involvement with the firing — something they categorically deny. @cluttercoco I’ve reported what I’ve been able to confirm. There was an outcry over Cleary’s leave and it only grew stronger when J.D. Irving posted a press release calling the coverage a “baseless conspiracy” and requesting an apology and an immediate removal of the piece. Despite that, some took the mention of JDI as an implication that Irving had a hand in the ordeal. Hundreds of comments, tweets, and posts said the New Brunswick government is under Irving’s thumb. Keith was also concerned that Poitras did not contact J.D. Irving for comment on the story despite later clarifying on Twitter that JDI did not play a role in Cleary’s leave. 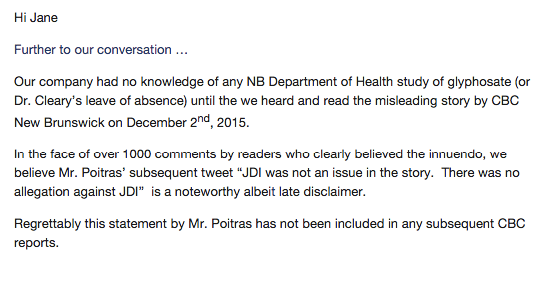 Poitras defended his article, saying because there are no allegations against JDI he did not pick up the phone. @poitrasCBC @CBCNB Still looking for direct answer please. As investigative reporter why didn’t you call? Darrow McIntyre, the executive producer of news at CBC New Brunswick said he does not have any public statements right now, but Poitras tweeted out that the CBC is standing by it. Keith said JDI and the CBC are trying to resolve the issue directly. Keith said there are no plans to sue CBC New Brunswick at the moment. J.D. Irving’s name has not appeared in any follow-up articles. And then Cleary was fired. BREAKING: Dr. Eilish Cleary says she’s been fired. In a letter to Minister of Health Victor Boudreau, the President of the New Brunswick Medical Society expressed concern with the situation and hope that Cleary’s dismissal was not politically motivated. The firing of Dr. Cleary continues to spark calls for transparency and her reinstatement as questions about the situation remain unanswered.